My aircraft collection climbs into double figures! Re: My aircraft collection climbs into double figures! Resin or not, it looks to me like you've done a quality job. An unusual type of plane which begs the question: did you have the option to build it with the wings tilted for short take-off? And no, the wings are only as they are, no other options. When I checked out the You Tube videos, and many still photos for reference, the wings when fully extended for short-runway landing are an amazing sight! Oops, pardon me. I guess I was thinking it was a "VTOL" like the V22 Osprey in which the props are rotated 90º ("tiltrotor") for take-off. For aerials use electric guitar light strings. One goes a helluva way in 1/72/1/43. If you know a player it could be a freebie. Now that looks great. You did a superb job! While we were not there for your struggles with the kit, we can sure bask in its niceness. And i am enjoying the view quite a bit, well done. David MG wrote: Nice one Jamie. He does, but I fear the shipping cost might be counter-productive! You only need an inch off his machine head trimmings ! I use brush hairs for aerials- either nylon or steel brushes will do. For 1:18, use a broom hair. 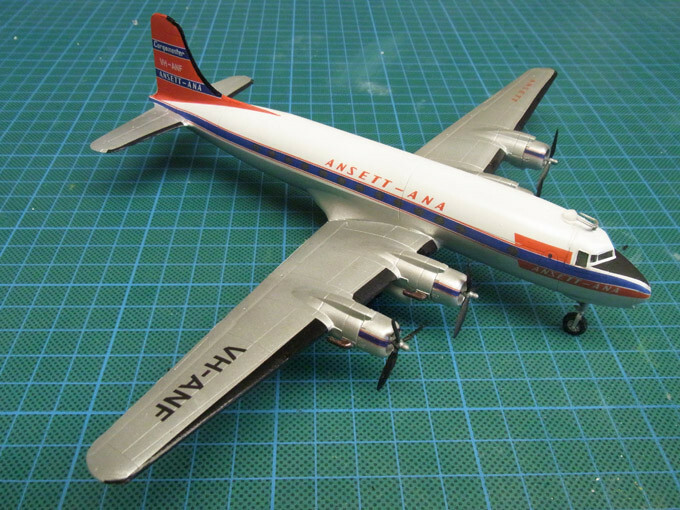 I much prefer the "working" planes and ships of the model-building world, and there wasn't anything much harder working than a Douglas DC4 cargo plane. Good old DC4s are still in the skies hauling freight. 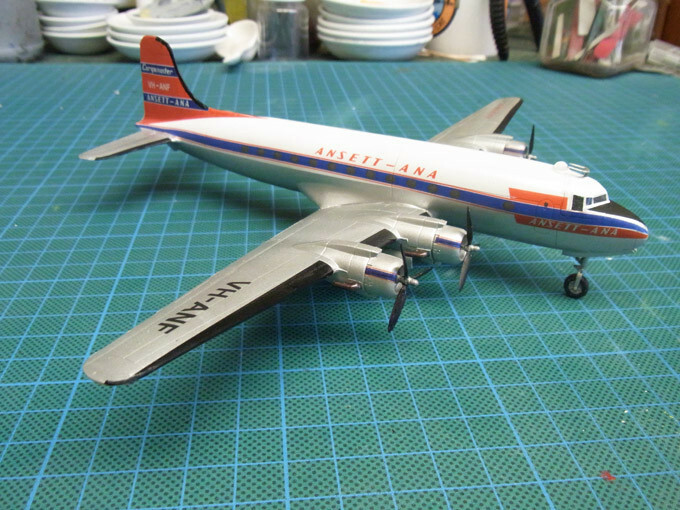 I had originally planned to complete my Douglas DC3/4/6 collection with yet more Pan Am livery, but while searching unsuccessfully for DC4 Pan Am livery to match my other two Douglases, I spotted this "Ansett Cargomaster" decal set on eBay, and as Ansett is a (defunct) Australian airline, that appealed to me just as much. 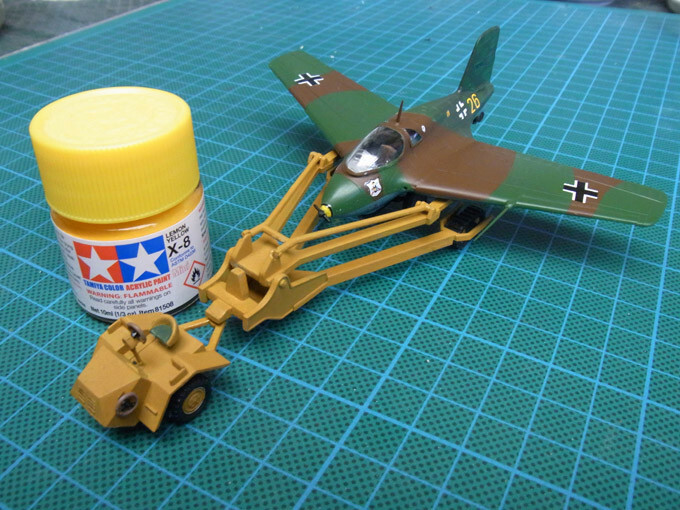 The decal set turned out to be OK, from a point of view of accurate fit to this 1/144 Minicraft kit, which it claimed to suit. All the mistakes with the decals are entirely my doing. 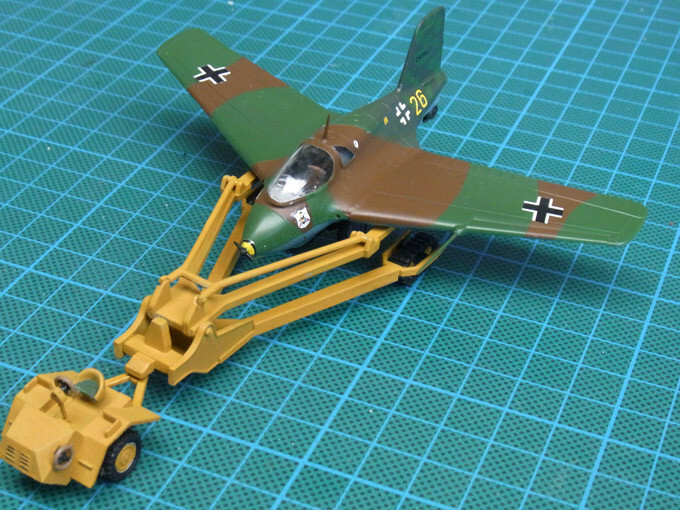 One thing you have to do with the Minicraft kits of many old propliners is fit some lead fishing sinkers into the nose section, to prevent the plane standing on its tail, once built. I like the cargo doors, and the Cargomaster livery generally, so it's nice to complete my Douglas trio with a cargo carrier. This appeals to me too. Looks nice and nostalgic, and you did a great job building it and applying the decals. Propliners are my all time favorite planes and this one looks great in this livery. What really got me is the fact that though the Germans built a few hundred of them, by the end of the war they had shot down a not-very-grand total of just nine (9) Allied bombers. That's it. One was a total flight time of 10 minutes, so that's hardly a lot of time to get in amongst it. Another was a huge speed differential between its 500+mph speeds and the 220mph speeds of the bombers it attacked. The rocket plane absolutely whizzed past its prey, with only a second or two to actually shoot at its target. Another was the slow rate of fire of its 30mm cannon, hardly a great feature when it had so little time to fire. And finally, once it was out of fuel, it turned into a glider which slowly returned to base. Allied fighter pilots quickly learned to hang around near German airbases, waiting to shoot down the 163s as they slowly descended. The whole thing is rather tiny, as that's a 10ml pot added here for scale. 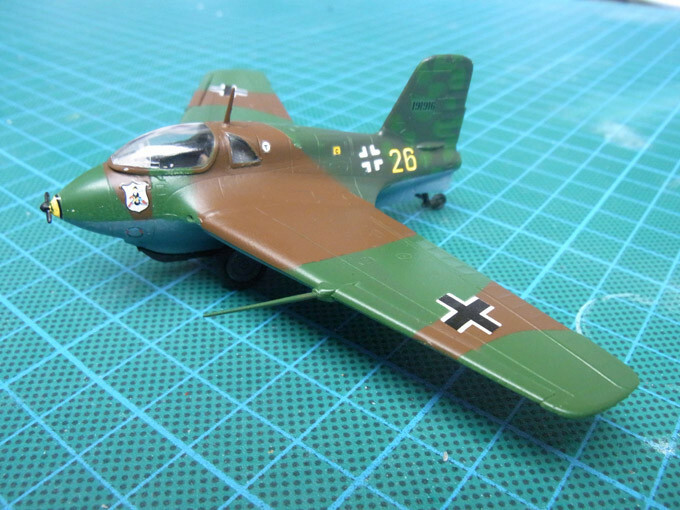 The kit (in 1/72 scale, made by a South Korean company, Academy) has the special tractor/trailer which hauled the ME163s around the airfields. As soon as I saw that little extra I was hooked on the idea of building a model of this spectacularly unsuccessful little attention-grabbing plane. 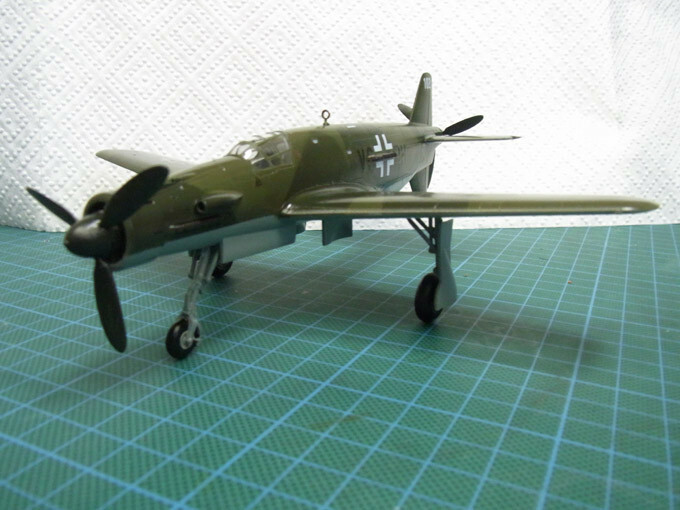 (The ME163s were fitted with little detachable wheel sets. So they were towed out to their runway on the trailer, offloaded from the trailer on their dodgy little wheels, pointed in the right direction, fired up the dangerous rocket engines, and as the planes took off at high speed they jettisoned their wheels above the runway). Here's the wee beastie on its own. Last edited by Ozmac on Thu Oct 29, 2015 8:32 pm, edited 1 time in total. Hi Jamie, nice build. Bet it's really tiny. As far as my wife Pam is concerned with my model planes, David, tiny = cute, and this one's a definite cutie! 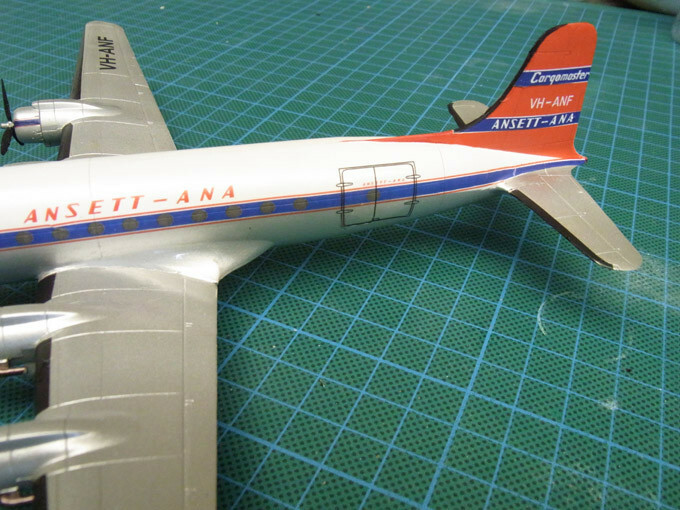 The plane itself is 8cm (3.15 inches) long. You did an amazing job on such a small plane! And whilst I hesitate to call a nazi killing machine -however ineffective- 'cute' it certainly is an interesting piece of history. I know what you mean about the Nazis, Tom. I don't like them at all and there's nothing cute about the bastards. It's a good thing this model didn't come with swastikas, which I particularly dislike and refuse to attach to models, even if they are authentic for the period. The Messerschmitt is quite interesting. The trailer is really part of the story,too. I wonder what the Allied pilots thought, seeing a plane with swept-back wings for the first time – traveling at 600 mph with no propeller. Were these aircraft ever suspected of being the lightning-fast "foo fighters" reported during WWII? Righto chaps, tally ho, we're back off to Antarctica in a plucky little Auster AOP Mk6. 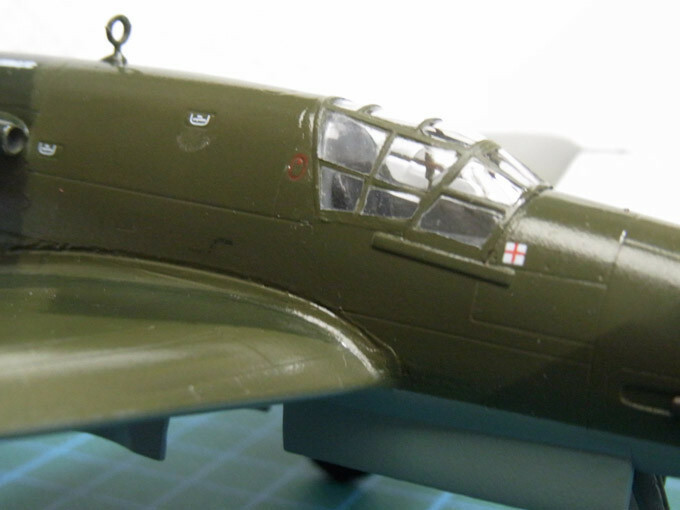 The kit is an old, old Airfix, reissued several times, but the mouldings for the wings have "1959" on the inside. This type of Auster first flew in 1945, its "AOP" name means 'Air Observation Post', and they did serve the RAF during the Malayan Emergency, and elsewhere. 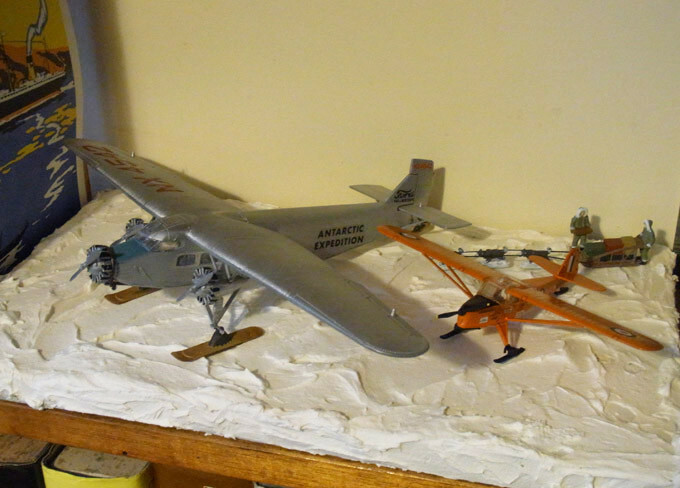 A specially fitted out Auster also worked in Antarctica in the 50s, hence the simple diorama. 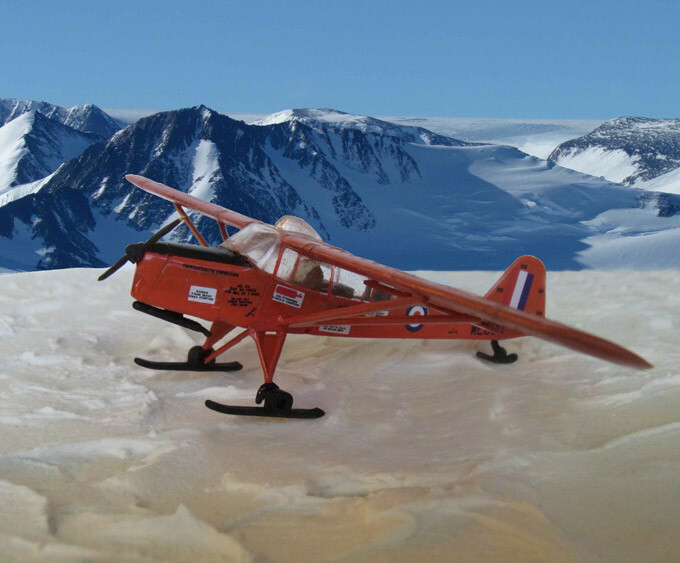 The box artwork has the plane as yellow, but several model builders insist the proper Antarctic colour is orange, while the plane which is now in a museum somewhere was painted yellow upon its return from Antarctica. 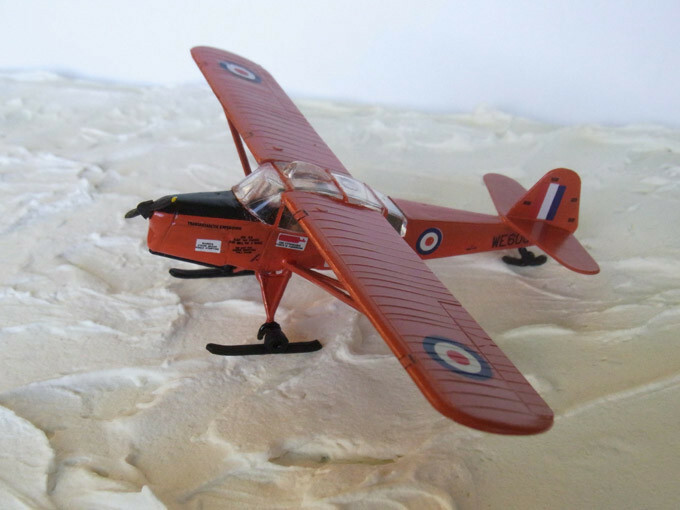 I've painted too many yellow planes of late, and I did have half a can of Tamiya orange to use up, so I'm in the "Orange Austers for Antarctica" camp. Rock on Jamie. It'll go well with your Ford Tri-Motor. Somehow I'm back in late World War Two again, with another bright German idea that didn't go anywhere, but it least it went fast! 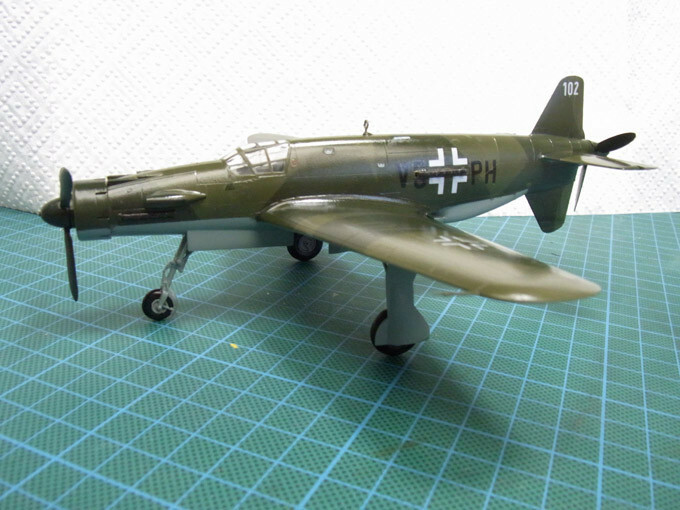 Dornier Do 335 Pfeil ("Arrow"), the fastest German piston-engined fighter to make into the skies in action, admittedly when the fighting was almost over. The Arrow flew! It had an engine up front, one down the back, and so that gave it a slippery shape the conventional twin-engined planes couldn't match. The "in-line" engines also apparently gave it nicely balanced handling, and even if one engine failed it still flew nicely and went remarkably quickly. The camouflage pattern is severe and angular, called "Splinter". And masking for the canopy was a trick, but I figured out a new technique. I scanned the canopy, then in Photoshop turned all the "blank" bits black, printed it out on paper, and then that formed a template for cutting out the masking tape. 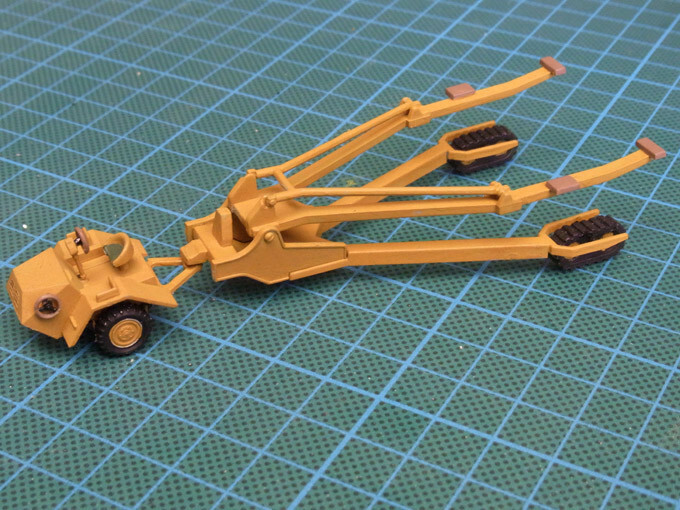 So far this is the tidiest result I've achieved on these small 1/72 scale models. 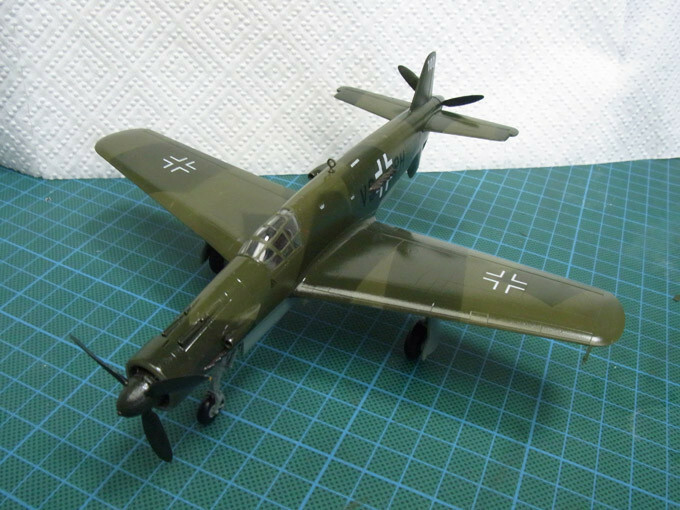 This might be the last plane I build for a while, as I have a rather large car diorama demanding my attention!